W.H. Kyle, senior buyer of the Robert Simpson Montreal Limited, arrived home Monday on the Queen Mary. Mr. Kyle expressed himself enthusiastically about the new Queen of the Atlantic. Her steady motion and spaciousness take all the discomfort from ocean travel. 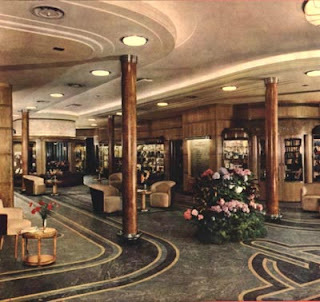 Mr. Kyle was visibly impressed with the specialty shops on the "Queen Mary." "They are every bit as smart as the most exclusive shops on Bond Street," he said. "They offer specialties for men as well as women and they were being well patronized."